Where Can You Get Vitamin C From? 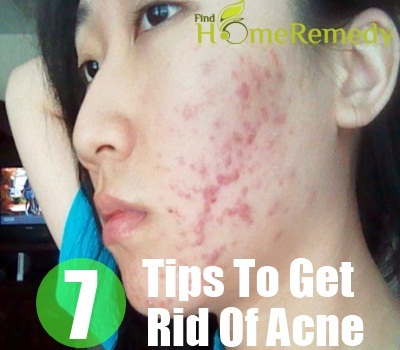 Acne is a condition of that keeps bothering individuals of all age groups. It is a problem that commonly surfaces in teenage, but is also observed in many adults as well. There are basically two types of acne, hormonal acne and cystic acne.While the reasons for hormonal acne are the changes occurring in the hormones within the body, cystic acne is caused due to problems with oil glands and skin infections. But, nevertheless both these conditions are problematic and difficult to manage. Many people apply chemicals and cosmetics for acne, but most often, they end up worsening their conditions. If you do not want to end up like that, it would be better that you take natural route. You can also use vitamins for this purpose. The best vitamin that can help in reducing the occurrence of acne is Vitamin C. A regular intake of this vitamin can provide relief from acne, to quite an extent. Vitamin C strengthens the immune system of an individual, thereby increasing its ability to fight diseases and microorganisms. It not only prevents the occurrence of acne, but also helps in its treatment. In fact, vitamin C is a complete vitamin that helps in keeping your skin healthy, rejuvenated and flawless. Vitamin C acts as an antioxidant to kill the free radicals damaging your skin. These free radicals can be from within the body or outside sources, like sunrays, dust and pollution. It provides the required strength to your skin, which helps in resisting the acne outbreaks. 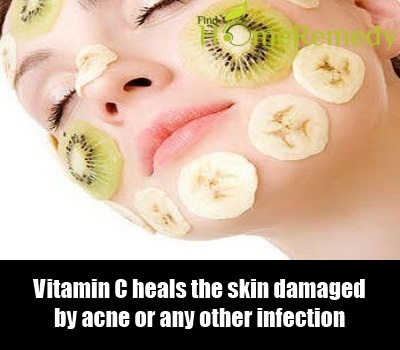 Vitamin C heals the skin damaged by acne or any other infection. It stimulates growth of ligaments and tissues, which help in healing the scars caused by acne. One of the main roles of this vitamin in skin health is to boost up the production of collagen. This collagen fiber helps in the formation of lower layers of skin and keeps them intact. It also stimulates the growth of blood vessels in the skin and improves circulation, further avoiding the outbreak of acne. With better production of collagen, your skin becomes more firm, flawless and beautiful. 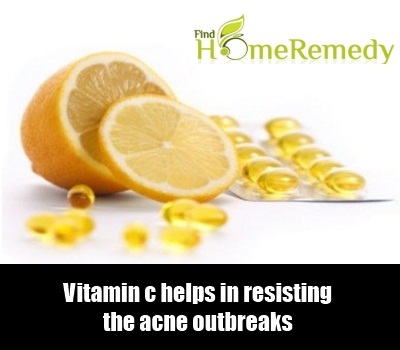 Vitamin C boosts up the immunity of your body and skin against the foreign infections, one the major causes for acne. It makes your skin strong, thereby increasing the resistance to acne. 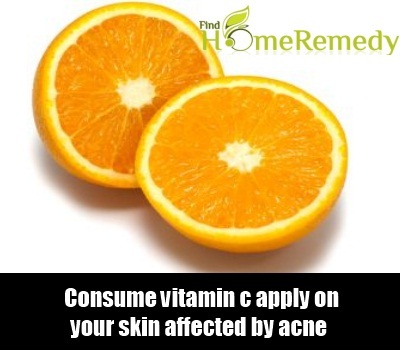 You can include vitamin C in your diet or apply is over your skin for getting rid of acne. The best way to get your daily dose of vitamin C would be, by including it in your diet. This is because vitamin C not only affects your skin, or just a particular part of your body rather, it promotes your overall health. 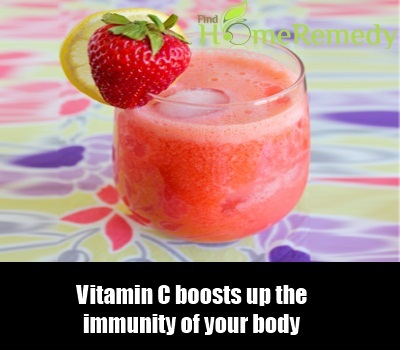 Consuming vitamin C in sufficient quantities will ensure that you are fit, healthy and free of infections. You can take anywhere between 1000 and 1600 mg of vitamin C, thrice in a day for best results. 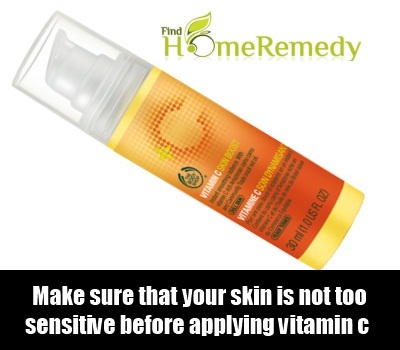 You can also apply vitamin C topically, on your skin affected by acne, but you may have to take certain precautions. In some people, vitamin C may cause mild irritation on topical application, which is bearable, but sometimes it may also cause burning sensation and even rashes. So, make sure that your skin is not too sensitive and the acne pores are closed, before applying vitamin C directly on your skin. You should make sure that you do not take too much of this vitamin, in an attempt to get faster relief from acne. Though a slightly higher dose of up to 2000 mg does not have any side effects, but an excessive intake of vitamin C can cause problems, like diarrhea, cramping, nausea, bloating, and other side effects related to gastrointestinal distress. However, if you continue to take this vitamin in excess for many days, it may also cause increased oxidative stress in your body tissues. It may also lead to atherosclerosis and kidney stones. 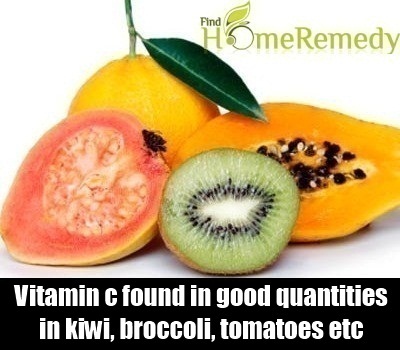 The best way to take vitamin C would be by increasing the intake of foods containing this vitamin. Vitamin C can be obtained from citrus fruits like oranges and lemons. It is also found in good quantities in kiwi, broccoli, tomatoes, strawberries, cantaloupe, peppers, and grapefruit. Acne is an extremely painful condition, which leaves scars on your skin. 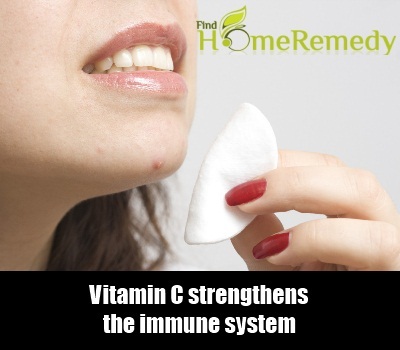 In order to get rid of this condition, and to get relief from it, you can take the help of vitamin C. Vitamin C coupled with a well balanced and healthy diet can work wonders for your skin and not only reduce the intensity of acne, but also prevent it from appearing on your skin altogether.